Here, however, was quite an offer. As discussed in our previous episode, we know a fellow who has been living in the Lakes Region of New Hampshire for a while, the type found prowling local junkyards, or machine or auto shops. Who might one day suddenly possess a CNC mill or amphibious vehicle or inscrutable widget that just needs this one part, and he knows a guy who has it and he just needs to do one thing, etc. Though, he also happens to be rather extraordinarily generous and outgoing, and interested in the ice racing that he’s heard about for so long, without ever seeing firsthand. The man can certainly appreciate a machine, and has an interest in automobiles, but it’s in utility rather than performance. He can keep something running far longer than most but, like most rational people, he has never needed a race car. These traits, plus enough time, leads to having various vehicles in various places in various conditions, and thus sometimes, a need to either pare down or make something worth keeping around. Near the autumn of 2017, after some noise had been made trying to find a car for the approaching ice racing season, he made an offer. Rather than some junkyard pick of unknown provenance, would I like to use his Volvo 740? It had lived across the country and been lived in, long-suffering but carefully maintained. It had seen very interesting times but worked well, was somehow completely rust-free, and had been a trusty companion until it was no longer the best option. Now, it was becoming a burden, and if it were to continue living, it would need to justify its existence. It was resting in limbo with another friend who agreed to let me start building the car on their property, a few hours away from my home. Not to understate my appreciation for having a place to work, but it is worth noting that onsite luxuries did not include easy access to power, running water, or a guaranteed lack of predatory wildlife. With the distances and timing involved, combined with inexperience, my own motivation was privately in doubt. The car did not cut a fine figure upon first impression, with baked-off paint and willfully ugly hubcaps on the outside, and every nook and cranny packed with peanut shells and scrap metal, having been used for storage. It took the first weekend to clean this to where it could be stripped, working slowly. The next, I was able to enlist a friend for the process of stripping the car to as close to a motorized shell as possible, and it’s shockingly clean underneath. We make solid progress and almost immediately, it starts to look, if not like a race car, at least like it’s going to become one. At this point, the future appears wide open. Admittedly there were bad ideas, including motor builds and custom suspension bits; instead, the next dozen-plus weekends are spent working through increasingly obscure issues with electronics or a lack thereof, giving it a very basic tune-up, and building to the rules to be sure the car will pass tech inspection. Common-sense items such as harnesses, window nets, and very basic fire safety equipment are required, in addition to the isolation of driver from batteries and gas tanks. Nothing difficult, but time consuming to learn on-the-fly. Unlike other ice racing organizations in the area, LRIRC requires a cage in all classes. Though, since speeds are fairly low for four-cylinder cars, these can run only a main hoop with NASCAR-style door bars; no A-pillar or halo bars are necessary (except for junior drivers,) and additional triangulation generally is not needed. Building this alone and in time wasn’t feasible, so it was done by someone who has prepared many cars for the club, and also does quite well in their own sprint car. Doors are welded shut, all glass but the windshield is removed. Swap meet Kirkey seat is bolted in, and it’s ready for trouble, at least. For all participants, the most challenging variable is traction; It’s a dark art, but this community is a shining example of neighborly values and friendly racers who help each other compete, and it took much less trial and error to refine the solution than it would have, had this not been the case. With the exception of a few experimental wildcards, virtually all cars will have some type of customized traditional chain on the drive axle, whether front or rear, with cross links graded for light trucks at a minimum, sometimes up to heavier-duty chains for larger trucks or skid steers. The cross links will be either V-bar or studded with each stud sharpened; if they come with a cross link every fourth link on the rim chain as most do, this will be doubled so that they cross every other link. 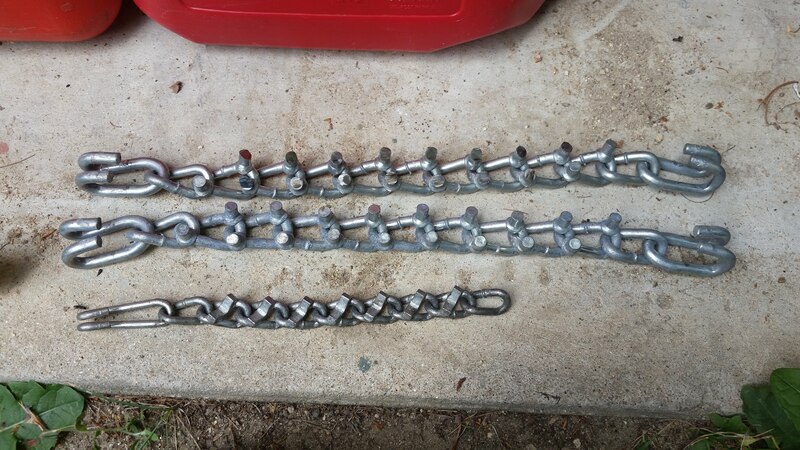 Now, since you may be putting a chain made for a tire sized 295/80/R22.5 onto one that is 185/60/R15, the rim chains and cross links are shortened, and with a simple tool (which is rather expensive likely because of its limited scope and market,) this is all crimped back together. On whichever end is being pushed or dragged, standard industrial roller chain is wrapped around the center of the tire, with snowmobile spikes or high-strength bolts pushed through the links for more bite. To keep this in place, tires are selected for advantageous center grooving, or hogged out with a hot chisel. All of these must also be tighter than you think is tight. Certainly tighter than feels safe. Using a tube deflator and compressed air to pull a vacuum, the tire is sucked into itself and, with all manner of ratchet straps, chain pullers, leverage, and/or muscle, the chains are stretched over the shriveled, shrunken tire, which is then pumped back up to somewhere between forty and sixty PSI, while a prayer is uttered that they don’t explode, because they sure look like they could. Watching the tire deform, I thought this was patently insane, but you don’t hear stories of them maiming anyone. Albeit, I didn’t ask for any. 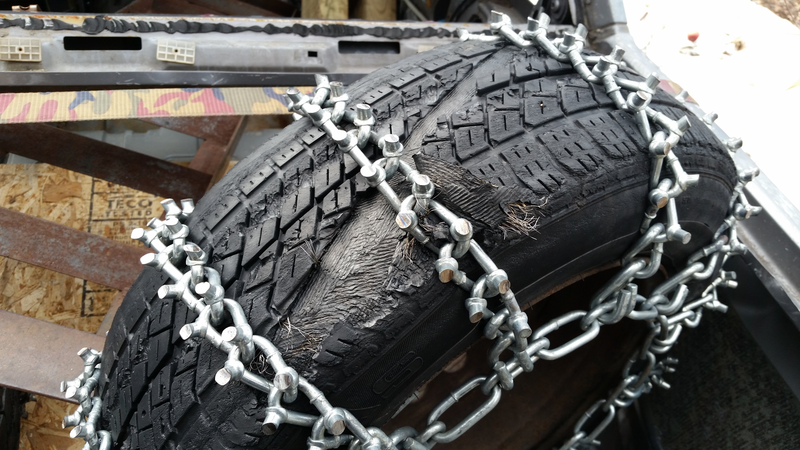 Apparently, no matter how worryingly deep the chains seem to be embedded into the tire’s carcass as you inflate it, they are not dug deeply enough. As everything stretches and settles while rolling beneath the car, it becomes clear why they needed to be so tight at first. These tires are also not necessarily new, adding another dimension to the tire degradation guessing game. Having worked outdoors each weekend as fall turned to winter, I knew quite well it was getting cold, but I was still caught off-guard when the announcement of the first race came, in the middle of January. I’d like to say there was some mad, dramatic scramble to finalize the car, but what actually happened is that I simply decided not to finish some things. No gauges, more electrical tape than I would have liked, and fluids I didn’t want leaking into a pond precariously exposed in the front of the car; these things had to be played as they lay. After a few final sweeps to make sure everything is tight enough and all rules are basically met, it was as ready as it could be drive onto a trailer and back off onto the ice. Through all of this, my partner in the process who provided the car had been working in parallel to get a tow vehicle ready, and collect all of the pieces necessary to transport the car to the races. At the intersection of our projects lay the true challenge, but you’ll have to come back for part three to see how it all goes. It is interesting to think about how Sweden’s two automakers built cars to deal with the countries’ near Artic conditions. Volvo with their overbuilt but underpowered RWD boxes. Saab with FWD but then slipping in those smaller Triumph motors that came alive at the top end. Logic might suggest Saab was best for conditions but I think in reality Volvo did better through winter while Saab was waiting to delight in springtime. I remember so fondly when different counties and even different companies within were able to approach problems/ opportunities differently. Can’t wait for part 3! I’ve been inspired enough to spend the last few evenings re-finding all of the ice racing stuff I had read a few years ago, sad to say it doesn’t seem like many of the clubs that do ice racing are as active any more, MIRA in Michigan just has a ghost-town facebook page, CNYIRA has apparently not been able to secure liability insurance for this season, and hasn’t ran in a few years due to mild winters. I really wish I had gone to at least spectate back when I lived closer to that stuff. But I’ve got the perfect ride to do it in now and I’m itching to test my mettle. Unfortunately I don’t know much about what’s happening in ice racing outside of the northeast, but if you can find any active, they will be happy to have you. As you’ve seen, they can use all the support they can get. The more I’ve researched this over the holidays, the more I realized that my ideal racing venue was sitting right underneath my nose here in Indianapolis: circle track racing. Our paved oval “Speedrome” just so happens to be starting a Ford-Panther class this year, with the emphasis being on minimally modified cars, even less than the fwd “hornet” class. The biggest and most complicated modification is the rollbar which needs to be attached to the frame. With my current limited driveway space, I’d have to convince a family friend who owns a sizable shop in town to see if he’d be interested in partaking (thankfully he’s the kind of person that enjoys such endeavors). Although judging by the P71 on a trailer in one of the shots, perhaps there is a reason the owner is moving on from this one. And the 1800S is pretty special, you’ve gotta admit. Apparently the Amazon was a fairly successful race car, but given the other options available in period it wouldn’t be my first choice if building a vintage racer. Never found them attractive. The 1800 is a much prettier car, but from what I understand they aren’t particularly exciting to drive. I think that the last picture showing a trophy & bent bodywork means the next installments will become more interesting. This certainly looks like good fun .